The Babino or Multi-Cordoned Ware (MCW) culture succeeds the Catacomb culture in the north Pontic area, and is characterised by ceramics with cord-marked decorations (horizontal lines, diagonally hatched triangles) on their upper surfaces. It continues in the same region as Catacomb, expanding northward into the southern forest area of the Middle Dnieper culture. Metal objects show continuity with Catacomb tradition, but become more developed. Bronze adzes are longer, slimmer, and more curved, as are bronze shaft–hole axes, flange-hilted daggers, and polished stone axes. Round disc-toggles and extensively retouched flint arrowheads feature also prominently (Parzinger 2013). Some of these objects—e.g. flange-hilted daggers, shaft–hole axes, round disc-toggles and flint arrowheads—have correlates in Sintashta burials. The leading MCW form is the outwardly round, in cross-section curved, bone disc with a large centre hole and an additional hole bored in the side, which occurs in the Abashevo culture. Both Abashevo and Sintashta are synchronous developments of the Pontic–Caspian steppe and forest-steppe regions, pointing to their interwoven cultural dynamics, probably through the expansionist Abashevo population (Parzinger 2013). Kurgan earth-banks are not very high, and as a rule contain one to three burials in a pit with vertical walls. Stone cists and timber fittings in building-block fashion anticipate the construction of the succeeding Srubna culture. The dead are not uniformly orientated or placed, with supine and crouched on the side being frequent positions. Grave goods are scarce, as is ceramic (Parzinger 2013). The number of settlements increases compared to previous periods, primarily on river terraces, with occasional fortified settlements on elevations pointing to more sedentary centres and higher interregional conflict than in previous periods. Houses include sunken earth-houses and ground-level wooden-post buildings with a rectangular plan. Animal husbandry is the main subsistence economy—mainly cattle, also sheep, goats, horses, and pigs—with no evidence of agriculture. Bridle cheek-pieces prove the use of horses for transport, probably to reach further pastures (Parzinger 2013). The LBA starts in the Eurasian steppes ca. 1900–1800 BC, contemporary with the central European Únětice EBA and Middle Helladic cultures of the Aegean MBA, and is represented by the rapid spread of a settled form of agropastoralism from a previous Sintashta–Potapovka–Filatovka core over a vast area to the east of the Urals, into the western Tian Shan and Altai Mountains, and to the west into the Danube River. This developing Srubna–Andronovo horizon has the Ural River and southern Ural steppes as its rough boundary, with some Andronovo (Alakul-type) materials on eastern Srubna settlements, and mixed Andronovo–Srubna settlements on the easternmost headwaters of the Samara River (Anthony 2016). In the forest-steppe and steppe zones of the Don–Volga interfluve, reaching as far as the Samara Valley, the latest variant of Abashevo is often referred to as the Pokrovka type, dating to ca. 2000–1700 BC. Both the Abashevo culture and Pokrovka type are often seen as, respectively, the formative and terminal periods of the same cultural complex, successor of the Corded Ware culture and predecessor of the Timber Grave phenomenon. However, its relationship with the Catacomb, Fatyanovo, Balanovo and Sintashta is widely debated (Chechushkov and Epimakhov 2018). The Pokrovka or early Srubna burials appeared first in the Middle Volga region as a transition of Potapovka pottery shapes, fabrics, and decorative motifs, representing thus an evolution of Potapovka potters. Pokrovka pottery and bronze weapon styles and grave types spread from the Volga–Ural steppes westward into the north Pontic steppes ca. 1800–1700 BC, probably thanks to the new warrior technology and also through intermarriages, as suggested by the adoption of local pottery-making customs. Compared to the previous period, it represents a transition to sedentary life, with the first permanent settlements, at the same time as pottery evolves to simpler ceramic types (Mochalov 2008). The group shows usually several kurgans in each cemetery, with each kurgan displaying one to three burials, being the first period in the region with cemeteries containing entire social groups, individuals of both sexes and all ages. Burial pits are rectangular, and they tend to be fairly large in size. Bodies are usually interred placed on their left side in a contracted position, with their arms bent and hands in front of their faces, and orientated to the north. Burials are often lined with organic mats, and remains of large domesticated animals and ochre (and sometimes chalk) are frequent (Popova, Murphy, and Khokhlov 2011). Some elite burials are marked by vessels with elaborated decoration and animal remains, and each separate cemetery seems to have vessels that copy ornamentation from bone rings found in burials with weapons. Burials of those with social power and prestige (such as Staroyurievo Cemetery, the Filatovka kurgan, etc.) are also accompanied by weapons, the insignia of power, and gold jewellery, and are conspicuously different from the rest of the graves of ordinary people. The same graves provide indirect evidence of the wide use of wheeled transport, such as bones of domesticated horse as draft animal, and studded elk-antler cheekpieces, the earliest artefacts of this kind in Eastern Europe, ca. 2000–1700 BC. Pokrovka is thus seen as an important part of the ‘chariot horizon’, representing a rapid extension of the chariot complex to vast areas of North Eurasia (Chechushkov and Epimakhov 2018). The Srubna or Timber-Grave culture (ca. 1600–1200 BC) represents thus a unified culture of the Pontic–Caspian steppes after the expansion of Pokrovka groups from the Volga replaced the previous cultures up to Crimea (Suppl. Fig. 13). In the east, most Pokrovka settlements continue to be occupied during the mature Srubna period. In the west, Srubna settlements appear in steppe and forest-steppe regions, in areas previously occupied by Multi-Corded Ware groups; to the north, southern Abashevo groups are replaced by Srubna. Further north, northern Abashevo groups—from the forest region between the Oka and Vetluga rivers—transition to the Pozdnyakovo culture (Parzinger 2013). Srubna (and Pozdnyakovo) pottery show vessel shape and ornamentation in common with Andronovo–Fëdorovo ware, although there is also some regional continuity of Srubna with Abashevo and MCW traditions. Ceramic comprises round to hour-glass shaped cups, bowls, and pots, as well as shoulder decorated (carved, pricked, impressed) with triangles, diamonds, and zigzag bands. Pottery shows homogeneous features with little regional or temporal variation, which is also common in Andronovo–Fëdorovo. The synchronous appearance and similarities of Pozdnyakovo (ca. 1850 BC) to the north of the forest-steppe in the Upper Don, Srubna to the west of the Urals, and Andronovo–Fëdorovo to the east, point to an expansion of related populations in eastern Europe (Parzinger 2013). Copper objects like spearheads, hooked sickles, flange-hilted daggers, narrow shaft–hole axes, and bracelets with spiral ends may have been made with copper from Kargaly in the Urals, where there was intensive copper mining (as previously in Yamna). Kargaly may have been the largest mining complex in the 2nd millennium BC Europe, which implies a substantial export trade. Arsenical and antimony bronzes predominate in Srubna, in contrast to the tin–bronzes prevalent in Andronovo, which are probably responsible in part for the tin–bronzes (ca. 25% of the total bronze objects) found in Srubna, especially in elite burials (Chernykh 1992). The scale of mining and metalworking displayed by Srubna–Andronovo materials suggest a complex organisation of the subsistence economy and trade networks beyond a simple herding economy. Kargaly copper was probably traded with help from wagons and traction animals (as suggested by specific pathologies) and through waterways up to Troy and the Aegean. Bone bridle attachments and bone discs with wavy ornamentation shows connections with the Mycenaean world through LBA cultures from the Carpathian Basin (Parzinger 2013). Common burial rite includes simple earth pits covered with an earth mound. Some burials show timber-lined grave chambers, while others show simple branches covering the grave. Bodies were in the contracted position on the side, orientated to the north, and few grave goods if any are deposited. Elites are not marked in the burial ritual, and only rarely are richer graves with weapons found (Parzinger 2013). The Srubna society was probably hierarchical in nature, dominated by tribal chiefs, although the specialised organisation probably determined different, equally important heterarchical relationships. This period represents a stabilisation of the population, with increased average life span (ca. 20 years, with men ca. 37 years, women ca. 39 years) compared to the previous period. A lesser proportion of children (ca. 30%) compared to the previous period and high survivorship to adolescence bring this period closer to those previous to the Sintashta–Potapovka crisis (Khokhlov 2016). In the north Pontic area, agriculture remained important, with Noua–Sabatinovka showing full agropastoral economy with a wide variety of cultivated grains. To the east of the Dnieper and on the Donets, some settlements were also agropastoral, but agriculture featured less importantly in the subsistence economy, and domestic grains were mostly millet. Settlements in the west show fortifications—either embankments or trenches—with farmstead-like clusters of houses (Figure 84) which could be earth-houses, dugouts (zemlyanki), built in partially sunken areas (poluzemlyanki), or ground-level wooden-post buildings (Parzinger 2013). In the east, settlements are small and unplanned, suggesting an extended family at each site. Herders from three or four distinct permanent settlements could occupy the same herding seasonal camps. Riverine bottomlands near marshes are preferred, either on the floodplain or on the first terrace. Subsistence economy in the Volga–Ural area does not show indications of agricultural diet, with agriculture having probably faded completely in this period. The main diet was cattle (50–60%), sheep, and goats for meat and dairy products (and occasionally pigs), apart from rare gathering and hunting traits, which frequently involve wolfs (Anthony 2016). Figure 84. 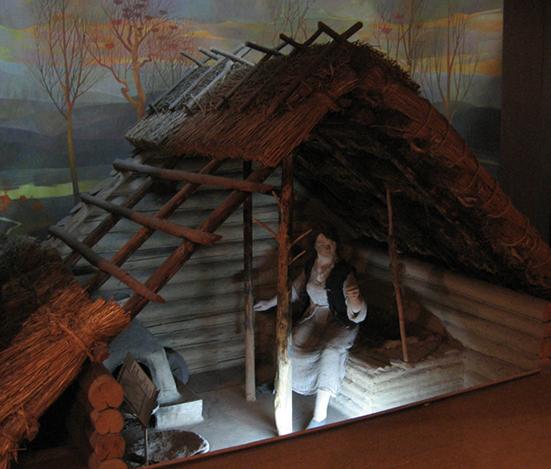 Reconstruction of house from Berezhnovka Srubna culture, between the Dnieper and the Volga, in the Ternopil history museum. Photo by Vodnik. Srubna shows a multiscalar regional organisation represented by three circles of relationship, namely obligation (for copper mining), cooperation (for herding), and affiliation (for shared rituals). For example, a mining settlement would be supported by surrounding pastoral communities, and would contribute in turn ore to surrounding communities which had firewood for smelting (Anthony 2016). Long-ranging contacts are supported by the presence of Srubna settlers in the Low Amu-Dary’a (Chorasmia), where Srubna elements appear mixed with the Alakul material culture, representing the Tazabagyab culture, the southernmost extension of the culture (Koryakova and Epimakhov 2007). The earliest date for horseback riding in warfare seems to have originated in this period, because of the rod-shaped artefacts (evolved from the tubular-bone-made cheekpieces used for chariots in Sintashta), suitable for rigid control of a ridden horse. The earliest specimens of that class, along with metal bits and weapons of a mounted warrior, date back to ca. 1200–1000 BC, which points to the Bronze Age as the emergence of this use (Chechushkov, Epimakhov, and Bersenev 2018). The first signs of bronze snaffle bit, improving control for horseback riding in more stressful and difficult activities (such as warfare), and developing horse dentistry among nomadic pastoralists ca 750 BC (Taylor, Bayarsaikhan, et al. 2018), point to continued innovations in the north-east Asian steppes after the expansion of Andronovo. Their repeated violation of the canid-eating taboo across generations, at least in the Volga–Ural region, point to the connection of dog/wolf–as–warrior myth associated with violent death and war, identified with the symbol of the savage fury that the warrior desired in battle (Anthony and Brown 2017). This tradition was thus more likely associated with war–bands, but maybe also with the Indo-European myth of dogs guarding the entrance to the afterlife, and thus with the ancient dog–as–death symbolism. The Sabatinovka culture (ca. 1500–1200 BC) appears as a western continuation of Srubna—overlapping with it—bounded by the steppe zone, from the Sea of Azov across the lower Dnieper until the lower Danube Valley. Ceramics show dishes, pots, and storage vessels with conical or slightly curved sides, simple bowls, and single and double-lugged vessels. The Noua culture (appearing ca. 1400–1300 BC) in the forest-steppes from the Dniester to Transylvania, appears at the same time as Sabatinovka, and with extensive similarities to it (see §VIII.11. Balkan province) supporting their common origin as part of the Srubna-like population expanding to the west (Parzinger 2013). Beaded decoration on the neck and shoulders links the Sabatinovka culture to the Sargary–Alekseevka culture (part of Andronovo) east of the Urals, and other western Siberian groups ca. 1500–900 BC. The European custom of depositing bronze objects in hoards gained acceptance in the Pontic–Caspian steppe and forest-steppe regions reaching as far as the Urals, probably through the intermediary Noua culture in the west (Parzinger 2013). Settlements in the north Pontic steppe and forest-steppe continued the previous MCW trend to grow, with houses becoming larger, multi-roomed complexes, and settlements divided in living and working quarters. Agriculture becomes part of the subsistence economy. Kurgans and flat cemeteries with the dead lying on the side (usually the left one) and head orientated to the east are the standard. Only exceptional rich warrior graves are seen (Parzinger 2013). Around 1200 BC, new cultures emerge in the Pontic–Caspian region and beyond, showing largely continuity with the previous period, and an expansion of a common type pottery called Simple-Relief-Band Ware (SRBW), also roller pottery (valikovaya keramika), the steppes and into Central Asia (Suppl. Fig. 13). This period is coincident with Hallstatt A in central Europe and sub-Mycenaean materials in Greece. It is characterised by an increased aridity that may have caused a crisis of the subsistence economy, with a gradual extension of seasonal herding movements eventually leading to a decline in settled pastoralism, increased residential mobility (Parpola 2013). SRBW cultures expanded the Srubna area westwards, northwards (to the Kamar River basin) and eastwards. In the east, the Alekseevka or Sargary culture (ca. 1500–900 BC) appeared in the steppe and forest steppe, with roller pottery remains occupying the whole Kazakhstan and Turkmenistan – previously occupied by the Andronovo culture (Parpola 2013). In southern and central Asia, the Yaz I-related cultures (ca. 1450–1000 BC) replace the BMAC, but continue many of its traditions, among them fortifications, evidenced in Tillya Tepe. No burials are found in south-central Asia between ca. 1500–500 BC, which suggests that these cultures adopted the custom of exposing their dead to vultures and other carrion animals, a practice common in Zoroastrianism, whose first text—the Avesta, oldest Iranian composition known—is supposed to have been composed in this region at the end of the 2nd millennium BC (Parpola 2013). The large-scale adoption of horse-riding warfare in central Asia and in the Iranian plateau, replacing chariotry, is probably associated with the rapid spread of the SRBW culture, and thus early Iranian languages. Terracotta figurines of horse rider in Pirak (ca. 1500 BC), in Pakistani Baluchistan, show anthropomorphic riders with bird’s beaks, which has been related to pointed felt caps of mounted Saka warriors from frozen tombs of the Altai mountains (ca. 500–200 BC) featuring at the top the shape of a bird’s head (Parpola 2013). In the Pontic–Caspian steppes, this period is associated with a movement northward away from the steppe border, and the first evidence of agriculture (already ca. 1400–1200 BC) in the Don–Volga–Ural region as part of the subsistence economy. The volume of mining and metal production also declined (Kuzmina 2008). The Belozerka culture (1200–900 BC) is a north Pontic culture with settlements scattered from the Don to the Danube. It shows partial continuity with Srubna-related traditions, but new ceramics are distinguishable, such as pot decoration with engraved, incised, and pricked diagonally hatched bands, or multi-line zigzag patterns. Also new are one- and two-looped curved brooches made of fine wire, while socketed axes, spearheads with semicircular blades, and grip-tongue daggers with lancet-shaped blades continue the Sabatinovka tradition (Parzinger 2013). Settlements lay on high terraces above rivers and estuaries, with traditional poluzemlyanki houses coexisting with a new type, ground-level wattle-and-daub houses with stone cladding. Animal husbandry continues as the main subsistence economy, while agriculture is uncertain. Burial rite consist of flat inhumation cemeteries and kurgans, with side-crouched position predominant and scarce grave goods, also continuing the Sabatinovka culture (Parzinger 2013). The Belogrudovka culture (ca. 1200–1000 BC) of the forest-steppe between the Dnieper and the Dniester shows inhumation and cremation in kurgans or flat cemeteries, with pottery continuing Noua and Sabatinovka traditions, while small and later finds show similarities with Belozerka in the steppe (Parzinger 2013). Between the Dnieper and the Don, the forest-steppe and adjacent forest areas are occupied by the Bondarikha culture, with the eastern Prikazanskaya culture corresponding to the same tradition in the Volga–Kama region. It shows a distinct pottery with pricked- and comb–stamped traditions, but also clear connections with Belozerka and Belogrudovka wares in its round-bellied cylindrical-necked vessels and biconical pots with hatched triangles and angular multi-lined patterns (Parzinger 2013). In the Early Iron Age, Simple-Relief-Band Ware cultures of the Eurasian steppes were succeeded by the early phases of likely Iranian-speaking mounted nomads (Suppl. Fig. 15). The Proto-Scythian period in the north Pontic steppe features the appearance of horse-riding nomads associated with Cimmerian assemblages. These early groups are represented by the Chernogorovka tradition (ca. 1000–800 BC) and by Novochrekassk (ca. 800–700 BC), with differences based on grave construction, deposition of the body, and artefact form, with the later period showing Assyrian-influenced finds in warrior elite graves (Parzinger 2013). To the north, in the Dnieper forest-steppes, Belogrudovka is replaced by the Chernoles culture, contemporaneous with Chernogorovka. It is in turn replaced by Zhabotin I (ca. 900–800 BC), contemporaneous with Novochrekassk, and contains pottery connecting it with the late Chernoles culture but also to the Cozia-Sakharna and Bessarabi I cultures of the lower Danube. Zhabotin II forms a bridge to Bessarabi II, while Zhabotin III (beginning ca. 700 BC) represents a bridge into the early Scythian period, with the first Greek imported ceramics (Parzinger 2013). On the Volga, the appearance of horse-borne nomads is identified as the Pre-Sauromatian tradition, characterised by weapons, horse harness, clothing, and pottery associated with the early Ananyino culture of the Middle Volga and traditions from the north Pontic area. At the beginning of the Iron Age (ca. 850 BC) a rapid cooling and humidification of the steppes provided a fertile region that allowed for an increasingly mobile pastoral economy to expand into steppe regions that were too arid to exploit. The Early Scythian period in southern Siberia (ca. 800–700 BC) represents a new form of nomadic pastoralism based on cavalry-based warfare, armed with new recurve bows and mass-produced socketed arrowheads. Scythians expand rapidly from Tian Shan and the Altai Mountains to the Pontic–Caspian steppes and the Kuban region during the early 7th century BC (Koryakova and Epimakhov 2007). This period is marked by broadly shared artistic styles (the “Animal Style”), and styles of horse trappings and weapons; by a return of the Pontic–Caspian steppes to mobile settlements in wagon camps; and is especially marked by lavish graves (Figure 85) of princes and kings (Parzinger 2013; Anthony 2016). Different groups (including Sarmatians and Saka) show cultural similarities but also differences in settlement, subsistence economy, political organisation, and mobility. For example, certain Scythian groups in the north Pontic forest-steppe apparently form some non-mobile, agriculturally-orientated urban societies concentrated in fortified settlements. Scythians and Sarmatians are traditionally identified as eastern Iranian peoples, judging from personal and god names and words attested from Greek and Persian sources, as well as by toponyms in the steppes and archaeological remains that correlate with rituals specified in later Persian texts (Parpola 2018). Figure 85.Scythian warriors drawn after figures on an electrum cup from the Kul’Oba kurgan burial (ca. 400–350 BC) near Kerch. The man on the leftwearing a diadem is likely to be the Scythian king. Hermitage Museum, St. Petersburg. To the north, the Gorodets culture from the forest-steppe zone (north and west of the Volga) shows fortified settlements during the Iron Age. Incursions of Gorodets iron makers into the Samara valley are seen by deposits of their typical pottery and a bloom or iron in the region (Kuznetsov and Mochalov 2016). This attests to continued contact between forest and steppe in the Cis-Ural region. The language spoken by peoples of the Pokrovka–Srubna culture of the Pontic–Caspian steppes, developed from Potapovka–Filatovka and late Abashevo groups, was most likely Iranian. The presence of some early Proto-Iranian loanwords in Finno-Ugric supports the continued presence of early Iranian tribes in contact with the north-eastern European forest zone, and the absence of clear Proto-Indo-Aryan borrowings suggests that this community was already separated, probably expanding with Andronovo into central Asia. Sampled individuals of Srubna include one of the Pokrovka phase from Mikhailovsky, in Samara (ca. 1900–1750 BC), of hg. R1a1a1b2-Z93, clustering close to Srubna and Sintashta samples, showing the first lineage of Yersinia pestis that possessed all vital genetic characteristics required for flea-borne transmission of plague in rodents, humans and other mammals. It belongs to a different strain from that found in European samples associated with earlier steppe migrations (see §vii.1. Western and Eastern Uralians), suggesting a further development and origin of expansion of the disease in the Bronze Age Pontic–Caspian steppes (Spyrou et al. 2018). Classical Srubna individuals from Samara (ca. 1900–1200 BC) show a continuation of the wide Potapovka cluster, with slightly more EEF ancestry than Potapovka (ca. 32%), consistent with increased Abashevo-related contribution. The ancestry of Srubna samples show an intermediate position between Sintashta and Yamna (Mathieson et al. 2015; Narasimhan et al. 2018; Krzewińska, Kılınç, et al. 2018), with a slight ‘northern’ shift relative to Sintashta-Andronovo, compatible with their increased WHG due to admixture with forest-steppe peoples, supported by the finding of an earlier north Pontic outlier close to Neolithic samples (see §VI.2.2. Catacomb). Reported haplogroups are dominated by R1-M173, in particular R1a1a1b2-Z93 (seven samples), with one R1a1a1b2a2-Z2124, one R1a1a1b2a2a1-Z2123. Two outliers from the Samara region, one from Barinovka, of hg. R1a1a1b2-Z93, and one from Spiridonovka (ca. 1850 BC), show more ANE ancestry, clustering closer to Afontova Gora (Mathieson et al. 2015), in line with West Siberian-like outliers of Sintashta (see §viii.17.1. Late Indo-Iranians). Most Srubna–Alakul samples from Kazburun and Muradym in the Trans-Volga forest-steppe (ca. 1900–1600 BC) show high genetic diversity, and an admixture similar to Srubna samples from Samara, clustering with them. All five Srubna–Alakul samples are reported of hg. R1a1-M459, two are probably of hg. R1a1a1b1a2-Z280, and four of hg. R1a1a1b2-Z93, including one R1a1a1b2a-Z94, one R1a1a1b2a2a1-Z2123, and one R1a1a1b2h-YP5585. This heterogeneity of lineages, including ‘northern’ R1a1a1b1a2-Z280, probably reflects closer contacts of this region with neighbouring Abashevo and Balanovo settlers, also consistent with the longer contacts of Iranian with Finno-Ugric. There is a Srubna–Alakul outlier (ca. 1745–1620 BC) showing more Near Eastern ancestry, clustering between modern Mordovians and northern Caucasus, in a new Iranian Steppe cluster ‘south’ of Yamna, later shared also by some Cimmerians, most Sarmatians, and some Scythians (Krzewińska, Kılınç, et al. 2018). The admixture found in this late outlier may be thus related to the expansion of Srubna peoples into the Lower Danube, evidenced by the contribution of EEF ancestry and ‘south-eastern’ PCA position of samples from Merichleri (ca. 1690 BC), and from Szólád, Hungary (ca. 1900 BC), of subclade R1a1a1b2-Z93 (Mathieson et al. 2018) and R1a1a1b2a2a1-Z2123 (Amorim et al. 2018) respectively, both most likely related to vanguard Srubna settlers that developed the Noua–Sabatinovka culture (see §viii.11. Thracians and Albanians). Whereas Srubna probably represented part of the earliest Proto-Iranian community, at the same time as other (probably early Western Iranian) groups migrated to the south into the Zeravshan valley (see §viii.19. Dravidians and Indo-Aryans), it is likely that early Eastern Iranian tribes like Scythians or Sarmatians emerged from regions near the southern Urals (Krzewińska, Kılınç, et al. 2018), given the contribution of WSHG ancestry (up to 25%) found. Similar ancestry is found to the east in different Andronovo sites, mainly east Alakul or Fëdorovo individuals from east Kazakhstan and the Altai: two outliers from Alakul Maitan (ca. 1880–1640 BC), two from Kairan (ca. 1750–1550 BC), and two from Oy-Dzhaylau, one early male (ca. 1675 BC) of hg. R1a1a1b2-Z93, and one female (ca. 1500 BC); and Zevakino in eastern Kazakhstan, continuing previous Fëdorovo stage with one MLBA male (ca. 1500 BC) of hg. R1a1a1b2-Z93, and six later LBA–Iron Age individuals (ca. 1200–900 BC), four of hg. R1a1a1b-Z645, including two R1a1a1b2-Z93, one of hg. R1b-M173, and one Q-M242. Sampled Cimmerians from the north Pontic steppe show a correspondingly increased amount of Siberian component, sharing more drift with the far eastern Karasuk population compared to the geographically closer Srubna. Pre-Scythian nomads from the Pontic–Caspian steppes include one from Mokra (ca. 923 BC), one from Glinoe Sad (ca. 873 BC), of hg. Q1a1a1a-Y558, and one individual from the Mezőcsát culture (ca. 980–830 BC), of hg. N-M231 (Gamba et al. 2014). The distinct ancestry and divergence of lineages may support the existence of a ‘Karasuk-Cimmerian cultural-historical community’ clearly distinct from East Iranian peoples (Krzewińska, Kılınç, et al. 2018). There is thus more genetic diversity in Cimmerians compared to earlier and later groups of the steppe, with increasing Near Eastern admixture through time reflecting admixture with Srubna-like populations, and the most recent sample from Glinoe Sad (ca. 860 BC) showing the typical Iranian Steppe cluster and hg. R1a1a1b2-Z93. The heterogeneity of Cimmerians and their original genetic links to Karasuk and East Asians obscure their ethnolinguistic identification, although the relationship of this culture with the emergence of Ananyino in the Middle Volga may be related to certain Altai traits in Uralic languages, including the spread of some N-M231(xN1a1-M46) lineages among Cis-Urals (Finno-Permic) and Trans-Urals (Ugric) populations, up to Hungary. Early Scythians show a corresponding loose cluster between Okunevo and Karasuk samples (see §viii.20.1. Ugrians and Samoyeds), evidencing the admixture of Steppe MLBA with WSHG. Early Scythians include those from the Zevakino-Chilikta group (ca. 9th–7th c. BC), early Central Sakas (ca. 800–750 BC), one of hg. E-M96; later Central Sakas, of the Tasmola culture (ca. 760–680 BC), two of hg. R1a1a1b2a2-Z2124; and individuals from Andy Bel (ca. 7th–6th c. BC). There is a clear separation in admixture between eastern and western Scythians, and among Inner Asian groups, with Central Sakas showing the highest WSHG admixture (ca. 50%), supporting the confederal nature of the Scythian organisation (de Barros Damgaard, Marchi, et al. 2018). Forty-four later samples from Pazyryk in eastern Kazakhstan (ca. 4th–3rd c. BC), one of hg. R1a1a1b2a2-Z2124, and ten Sakas from the Tian Shan region (ca. 450–80 BC), including two R-M207, three R1-M173, and one R1a1-M459, show contributions from CHG/IN-related ancestry (ca. 5%), apart from Steppe MLBA (ca. 70%) and WSHG (ca. 25%), with a corresponding ‘southern’ shift in the PCA (Unterländer et al. 2017). This is compatible with the migration of peoples from Turan into the Kazakh steppes and forest-steppe region in the mid–2nd millennium BC (see §viii.19. Dravidians and Indo-Aryans), since this ancestry is also found in the Mezhovska culture from the Trans-Urals forest region (ca. 1500 BC, see §viii.20.1. Ugrians and Samoyeds), and later among Scythians from the southern Trans-Urals and north Pontic area, in a “Southern Steppe MLBA cluster” (de Barros Damgaard, Marchi, et al. 2018). The shift to east Asian ancestry compared to Srubna is accompanied by mtDNA lineages, which show equal proportion of east and west Eurasian origin in eastern Scythians, but increasing eastern origin in western Scythians, from zero in early samples to 18-26% in later periods (Unterländer et al. 2017). Sampled Scythians from Nadezhdinka, in the Samara region (ca. 375–203 BC), of hg. R1a1a1b2a2a1-Z2123 (Mathieson et al. 2015), as well as three sampled Scythians from the north Pontic region near the Dnieper (ca. 790–115 BC), one of hg. R1a1a1b2a2a1-Z2123, form part of the Iranian Steppe cluster, although one shows a high genetic drift with previous Srubna samples. This Western Iranian Steppe cluster is also shared by the previous Mezőcsát sample from Hungary, and have East Asian ancestry shared with Cimmerians and Sarmatians. North Pontic Scythians close to the described Southern Steppe MLBA cluster, showing more Near Eastern ancestry, includes one South-Eastern Steppe cluster, in common with south-eastern Europeans, one of hg. R1b1a1b1b3-Z2106, one E1b1b1a1b1-L618; and an intermediate cluster between Iranian Steppe and south-eastern Europeans, with one hg. R1b1a1b1a2c-Z2103 and one I2a1b1a2a1b-Y7219. A northern European cluster among Scythians, including one sample of hg. R1b1a1b1a1a2-P312, suggests close contacts of the north-west Pontic area with Celtic populations from Hallstatt. This high intragroup diversity compared to Bronze Age groups is also found in sampled Hungarian Scythians (ca. 756-370 BC), one of hg. R1-M173, who falls between Iranian Steppe, South-Eastern Steppe, and northern European clusters (de Barros Damgaard, Marchi, et al. 2018), while recently sampled Scythians from south-central Ukraine form part of three similarly described clusters (Järve et al. 2018). This temporal and geographical transect of Scythians offers a picture of variable admixture in the north Pontic area, proper of migrating nomadic settlers interacting with local populations, and of cultural dominance rather than population replacement (see §viii.20.3. Turkic peoples and Mongolsfor more on central Asian nomads). Sampled Sarmatians from the southern Urals show a cluster similar to the described Iranian Steppe one, showing genetic continuity over centuries despite the supposed cultural shift and suspected earlier population replacement between early and middle/late Sarmatians (Krzewińska, Kılınç, et al. 2018). Assessed individuals include Early Sarmatians from Pokrovka in the southern Urals (ca. 500–100 BC), one of hg. R1b1a1b1b-Z2103 (Veeramah et al. 2018); Sarmatians from the central Asian steppe (ca. 50–15 BC), one of hg. I2b-L415, from the Caspian steppe (ca. 85 BC – AD 15), three of hg. R1-M173, one of hg. R1a1a1b2a2a-Z2125 (de Barros Damgaard, Marchi, et al. 2018); and late Sarmatians from the south-east and south-west Urals (ca. AD 55–320), three of hg. R1a1a1b2a2-Z2124, one R1a1a1b2a2a1-Z2123 and the other R1a1a1b2a2b-Z2122 (Krzewińska, Kılınç, et al. 2018). The Wusun and Kangju are probably also East Iranian groups that became isolated after the expansion of Xiongnu-related nomads, and re-emerged into the central steppe from south-east of the Tian Shan mountains, evidenced by their Iran Neolithic-related ancestry and the lack of East Asian admixture compared to Iron Age Sakas. This interpretation of resurging East Iranian population is also supported by their position in the PCA, between Sarmatians and Sakas (de Barros Damgaard, Marchi, et al. 2018). Ancient Alans (AD 4th–14th c.) and individuals of Saltovo-Mayatsk culture (AD 8–10th c.) from the northern Caucasus and Middle Don basin cluster with Near Eastern / Caucasus individuals. Saltovo-Mayatsk shows six samples of hg. G2-P287, one J2a-M410, and two R1-M173, one among them R1a1a1b2a2-Z2124. Among six samples from the northern Caucasus one shows hg. R1a1a1b2a2a3-S23592 (de Barros Damgaard, Marchi, et al. 2018); and among two other samples also from North Ossetia (AD 300-400), there is one of hg. R1a1a1b2a2-Z2124, and one G2a-P15 (Afanas'ev et al. 2014).